There’s a Chinese saying that every smile makes you a day younger. If you are one of those who tend to avoid smiling in order to hide a broken or chipped teeth, diastema (space between teeth), misshapen or misaligned, worn down or stained teeth, then porcelain veneers in Thailand could be an easy solution for you. Porcelain veneer is an ultra-thin, custom-made corrective coating made of porcelain and is applied onto the surface of the tooth to improve its appearance and/or correct damages. With dental problems on a constant rise, more and more people are saving up for quality and inexpensive dental treatments abroad. The figures collected by the American Academy of Cosmetic Dentistry in a 2007 survey, showed that the demand for cosmetic dentistry procedures would be increasing every year. Porcelain veneers look very natural. Porcelain is a durable and translucent material whose texture looks like the enamel of a human tooth. Porcelain is easily tolerated by our gum tissues. With porcelain veneers there’s a possible risk of breakage. In that case you’d have to get a new one made. But if your veneer has slipped off, you can have it reattached by your dentist. To prevent twisting or breaking your laminate, avoid chewing bones, cracking nutshells, clenching or biting your finger nails. Porcelain laminates may increase your tooth-sensitivity to cold or hot food and drinks. However, it can be a temporary condition and may not affect all patients. Porcelain veneers can sometimes be costlier than composite dental laminates. Porcelain veneers in Thailand are considerably low priced. In general, the cost of porcelain laminates is influenced by a number of factors such as the dental condition, geographic location of the clinic, professional experience of the dentist, dental lab charges and hospital fees. If you are traveling abroad you’d also have to count in your airfare, local transport and accommodation charges. However, despite these, the total cost of treatments such as dental implants, porcelain veneers and lumineers in Thailand is several times lower than that in Australia, the UK, and the USA. Why Choose Porcelain Veneers in Thailand? your pretty smile back but also have an opportunity to explore the culturally enriched regions of the country. Dental veneers in Phuket, Thailand are thus a common choice for those who want to combine their dental trip with a Thai discovery tour. Whether you have booked for porcelain veneers or partial ceramic crowns in Thailand, you are least likely to get stuck in a long waiting list. 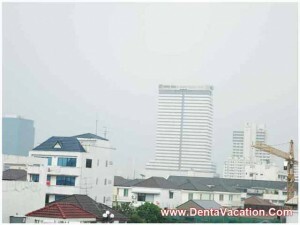 There are many reputed dental clinics in Bangkok which are known for their quick action when it comes to appointments. Dental treatment options are available in more than one Thai city. For example, if you want to avail teeth colored dental crowns in Thailand just contact us through the form to the right of this page and we’ll recommend which city will suit you the best. Besides being friendly, most of the dental staff in the leading clinics of the country is proficient in English. Some clinics also have provisions for multilingual interpreters. It isn’t difficult to come across dental experts in Thailand who’ve been trained in the West and have years of experience under their belt. Make sure you thoroughly discuss about the risks associated with your treatment to get dental veneers in Thailand. VISA and MasterCard are widely accepted in Thailand. From the airport you can take a metered taxi, the Airport Express bus, public bus or van, or rent a car. Try to check the weather conditions before traveling. For instance, patients who want to have veneers in Pattaya, Thailand should usually avoid the rainy season. If done correctly porcelain laminates can last for several years. From quality to cost, porcelain veneers in Thailand would not just be worthy of the money you spend but also help restore the smile you were longing for. Submit the free quote request form on the right to receive more information on porcelain veneers in Thailand.